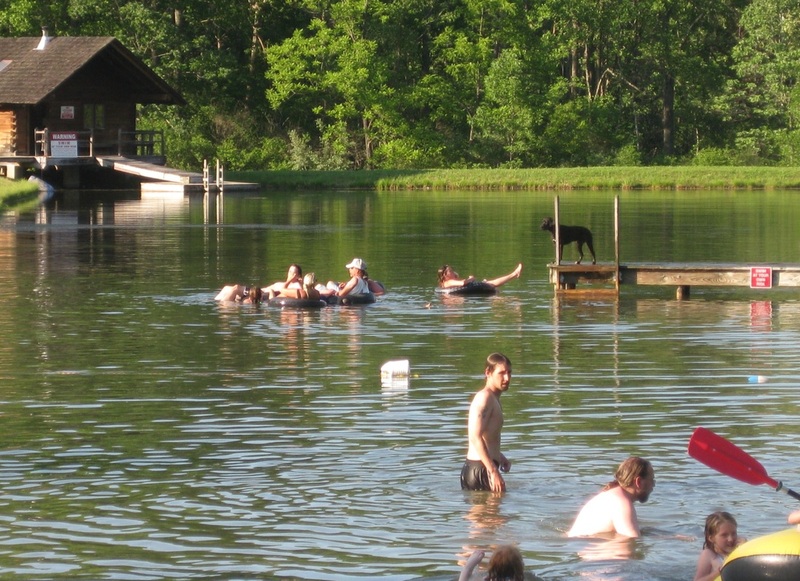 Four private sleep cabins and a large duplex kitchen cabin, a lake, a beach, a lakefront wood fired sauna with floating dock, shower house, hiking trails, wetlands, and more in Capon Bridge, WV. Direct links to the Airbnb reservation system for each cabin are below. 4 private sleep cabin rentals and additionally a large communal duplex kitchen cabin designed entirely for eating, cooking, hanging out, all night fun, noise, card playing, early morning coffee....with the sleep cabins designed entirely for sleeping, quiet, relaxing, and resting. 4 total separate sleeping quarters, each sleeps up to 6 and a communal kitchen cabin for all to use and share. Shower house with hot showers fully operational! 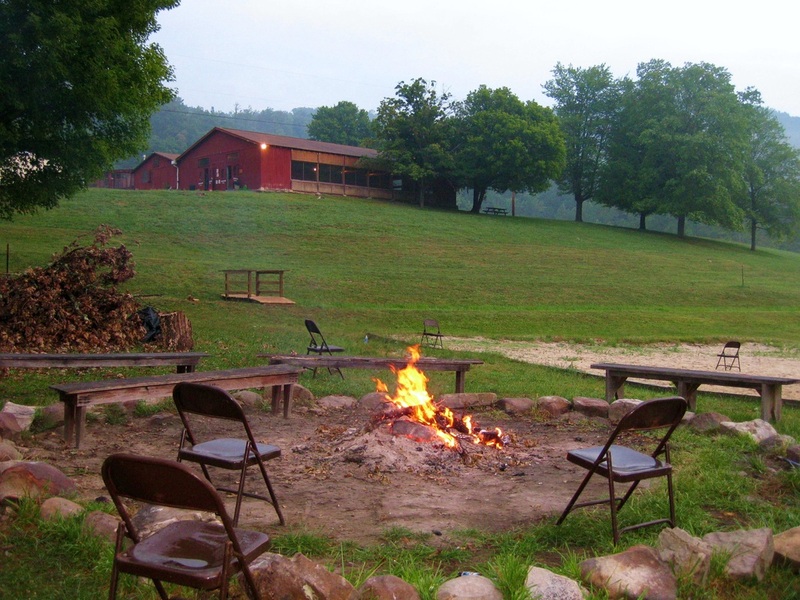 With a big communal bon-fire pit outside of the large kitchen cabin, picnic tables under trees and at the fire pit, and lots of open field and grass to relax and enjoy. A beach house with white sand beach, volleyball, horse shoes, a big wrap around porch, game room, lake, lakefront wood fired sauna with floating dock, lake dock to swim out to, fishing, hiking, Frisbee on the beach, picnic tables and comfortable seating, and a creek that surrounds the beach house on 3 sides.... lots of beauty and fun to soak up. Further, corn hole and ladders games under a 3800 square foot covered pavilion, a lake view dining hall gathering place, and 8 basketball courts in a 10,000 square foot gymnasium. 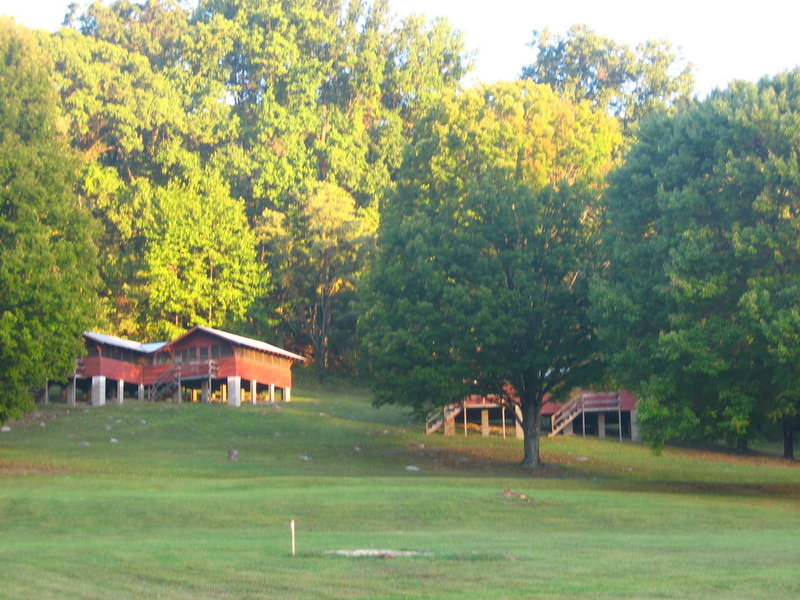 The cabins are part of an old Jewish kids camp called Buffalo Gap Camp dating back to 1950 by Herman Rubenstein and Jerry Smith.... now being renovated by a group of like minded investors and the whole Buffalo Gap Retreat justs gets better by the week. 1. Heading west on U.S. Rt. 50 through the town of Capon Bridge, make the first right turn onto Coldstream Rd. just after crossing over the green truss bridge and cacapon river. 3. Proceed about 0,4 miles on Rubenstein Rd. to a pair of red gates on right hand side and entrance to camp -- gates should be open. 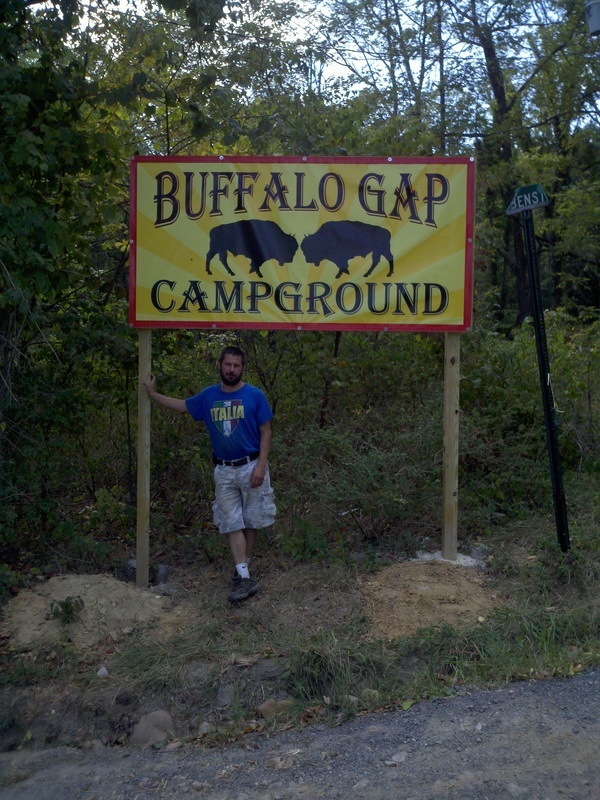 More Buffalo Gap Retreat banners at the entrance. 4. 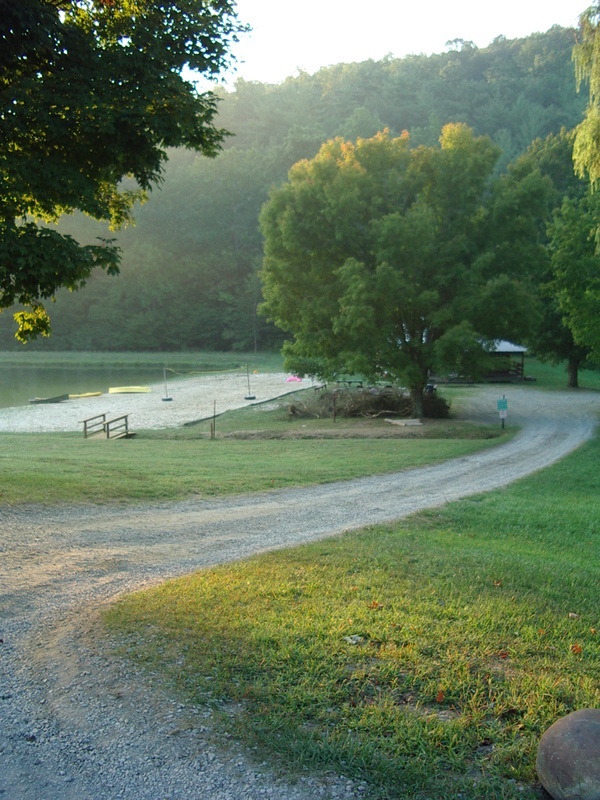 Drive around the big pavilion and up to the cabins with yellow lights above the porch and a green shower trailer. Park parallel to the road in front of your cabin area. Cabin #1: Easy Walk. This duplex cottage consists of two 475 square foot efficiency units that each sleep up to 6 in twin beds (that can be combined to form queen/king). Each has furnishings, tables and chairs, panoramic windows that can be opened with screens or shut, fans, and lots of natural light. Separated by a door that is locked from both sides, cabin #1 and #2 can be rented together to sleep up to 12 for larger groups or families. Downhill closer to parked cars for easier walks. Cabin #2: Most Private. This duplex cottage consists of two 475 square foot efficiency units that each sleep up to 6 in twin beds (that can be combined to form queen/king). Each has furnishings, tables and chairs, panoramic windows that can be opened with screens or shut, fans, and lots of natural light. Separated by a door that is locked from both sides, cabin #1 and #2 can be rented together to sleep up to 12 for larger groups or families. Downhill closer to parked cars for easier walks. Cabin #3: Most Private. This duplex cottage consists of two 475 square foot efficiency units that each sleep up to 6 in twin beds (that can be combined to form queen/king). Each has furnishings, tables and chairs, panoramic windows that can be opened with screens or shut, fans, and lots of natural light. Separated by a door that is locked from both sides, cabin #3 and #4 can be rented together to sleep up to 12 for larger groups or families. Uphill for a bit more challenging walk from the car or kitchen cabin. Call or text 703-328-1840 or email for any other inquiries such as large groups or events - vlombardi2003@msn.com. The AirBNB reservation system will guide you through the rental and payment process as well as allow you to contact me with additional questions. $75 per night weekends, $60 per night weekdays during high season. Each cabin half (duplex) sleeps up to 6 and has full but shared use of a 850 square foot community kitchen cabin -- details below as well as a community bon-fire central to the cabins and another at the beach/lake house. Firewood is included, and each of the four cabin halves is exclusive and private for you and your guests. Sleeping cabin quiet hours are from 10pm to 8am. 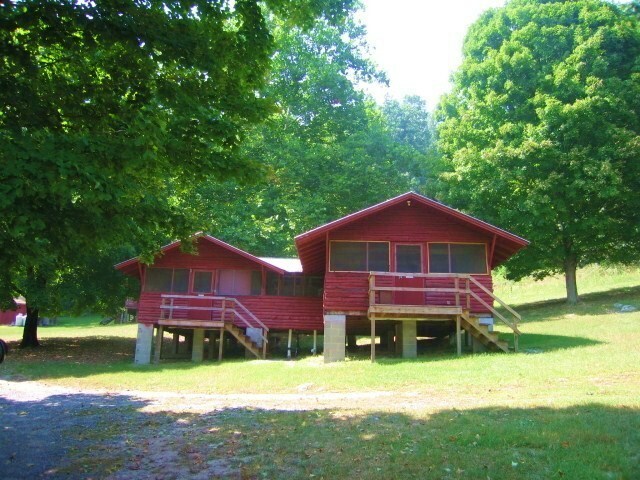 Kitchen cabin and bon-fire area have no quiet hours, but respectful volumes appreciated after hours for those sleeping. 6 person max. per rental (6 twin beds per cabin side) but includes use of tents outside for 6 total people inside and out. Community shower house (men's / women's side) with hot water -- septic and toilets coming in 2017. No keys required but please keep valuables locked safely in your vehicle. Plenty of parking and leashed pets welcome. 2 full size refrigerator -- for all to use. bring your own twin sheets, pillows, blankets and/or sleeping bags. interior and porch lighting and overhead fans​ and pedestal fans in each room. a full shower house with 4 mens and 4 womens shower heads on two halves of a 42 foot tractor trailer converted shower house with hot water and soap supplied. pets welcome - please clean up after them and keep them on a leash. flotation toys such as inflatable inner-tubes and rafts are blown up and available in the beach house game room -- door unlocked. 3.) the wood fired sauna on the lake.